,lpad ('* * *', floor (maxwidth/2) + 3)) "Merry Christmas"
... and in case your wondering what the result would be, I added a screenshot. My presentation on Analytic Functions is accepted for the ODTUG Kaleidoscope 2010 conference. The other abstract that I sent in is an alternate, standby if you will. As you can see on the right side, I have attended (and presented) at the ODTUG yearly conference since 2005. In The Netherlands, where I'm from, we do have Multibyte characters. Names with diacritic characters occur frequently. In a prior post I've written about using Oracle text to perform diacritic searches. This post is about the table definition. Every now and then this problem rears its ugly head, that's why I decided to write this little note on it. Do you know what it looks like when a couple of guys are trying out how much electricity runs through an electric fence? Planboard Symposium, the day after. Yesterday the Planboard Symposium, a symposium for DBA presented by DBA, took place in Driebergen, The Netherlands. The setup of this conference is a little different from what I'm used to. Only two parallel sessions to choose from with lots of time in between the sessions, which is nice for networking. As a consolodation price for those of you that didn't attend the Planboard Symposium, here is my presentation. View more presentations from AlexNuijten. Oracle recommends using CLOB instead of LONG for columns in the database. We all know this, right? Using CLOB is a lot easier than trying to manipulate LONG. Makes our life a lot easier. Not too long ago I wrote a blog on using DBMS_METADATA to extract DDL for tables, so when I got an assignment to migrate Users I immediately thought of using DBMS_METADATA to do this. The User Migration would consist of all the users in the database being renamed following a new convention. Don't ask why they wanted this, they had some very good reasons to want so. All the users had to be recreated along with all their privileges to their new name. At first I thought of writing all sorts of queries against the datadictionary which sounded like a daunting task. On second thought it dawned to me that a CREATE USER statement is DDL and DDL can be extracted using DBMS_METADATA. Google is your friend at times like that. Turned out you can use DBMS_METADATA to generate the CREATE USER statement, very easily. 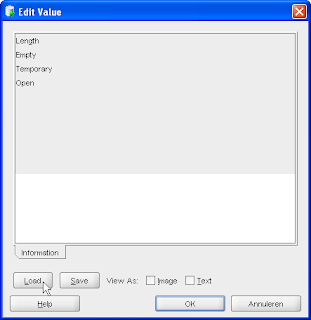 There are several ways to do this, but I will only show you how to do this using SQL Developer. Why? Because I just came across this functionality the other day. However there are some things you have to pay attention to, you might get frustrated with it otherwise. This post will be mainly in Dutch. It's about a Preview we are doing in our office in Nieuwegein, The Netherlands. The sessions will probably be in Dutch, but can be changed on the fly to English if desired. If you are not able to make it to our office, you still have a chance to see Patrick do his presentations in Atlanta, Georgia during the Oracle PL/SQL Programming Conference, November 10 and 11. De Oracle PL/SQL Programming conference vind dit jaar in Atlanta, Georgia plaats. Patrick Barel is daarbij om een drietal presentaties te geven. Voor degene die niet aanwezig zullen zijn in Atlanta vind deze OPP-Preview plaats. Tijdens deze KC zal Patrick twee van deze presentaties geven. Na het diner zal Alex een re-run geven van zijn ODTUG presentatie: "SQL Holmes". Pipelined table functions offer an ideal convergence of the elegance and simplicity of PL/SQL with the performance of SQL. Complex data transformations are effortless to develop and support with PL/SQL, yet to achieve high-performance data processing, we often resort to set-based SQL solutions. Pipelined functions bridge the gap between the two methods effortlessly, but they also have some unique performance features of their own, making them a superb performance optimization tool. During this presentation, a case study is unfolded to reveal the true cause of a slow performing query. Did the database just "have a bad day"? Was the evil DBA to blame? The PL/SQL developer who didn't get enough coffee? Or was it the application sending the "wrong" query in the first place? Collections (array-like structures in PL/SQL) are used in two of the most important performance features of PL/SQL: FORALL and BULK COLLECT. This session demonstrates the power of these features and offers in-depth guidance on how to apply them. The other day I needed to get some DDL statements from the datadictionary. In the old days you could write your own queries to extract all this. Nowadays you can use the built in package DBMS_METADATA to get the DDL for you. Let's take a look at how you can use this. The DDL that I want to extract is the infamous EMP table, normally in the SCOTT schema. To make it a little more interesting, we also add the DEPT table and place some constraints on them. If you use DBMS_METADATA just like that, you might get more than you asked for. As you can in the code block above, you get the complete DDL including the storage clauses and the constraints. If this is not what you want, and I didn't want all this, than you need to modify some transformation parameters. Each of these transformation parameters take out bit by bit parts of the generated DDL. After running the above anonymous block we will get the following result. That's more like it, just what I was after. The plain DDL for the EMP table. Yesterday I got the fifth edition of "Oracle PL/SQL Programming" by Steven Feuerstein. Another 1200+ pages on PL/SQL. This edition has been updated to cover versions through Oracle 11gR2. 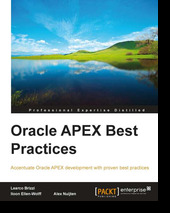 It is loaded with the latest on Oracle PL/SQL Programming, hence the title. When I started programming in PL/SQL I had a great mentor. When I told him I had a hard time writing PL/SQL, he advised me to get Feuerstein's book (the second edition was just out). Immediately I loved it, couldn't put it down. I dragged this book everywhere. Reading it in the traffic jam on my way to work, reading it before I went to sleep. By the time I finished that book, people at work started asking me questions about PL/SQL. Next to my copy of the Second Edition are also the Third and the Fourth edition. And now, I need to clear some space on the shelve, the fifth edition will take it's place soon. After I'm finished reading it. 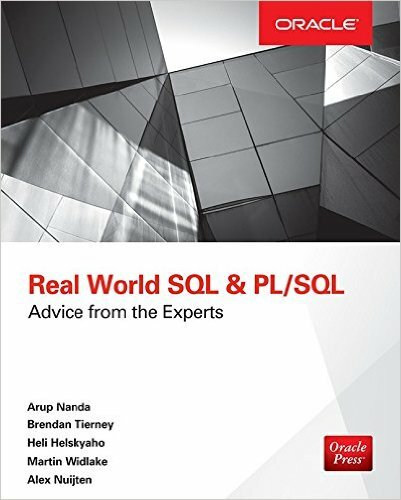 I'm sure this book is a must have for anyone who uses PL/SQL on a daily basis. For the fourth time the Planboard Symposium will be held on November 17. This symposium is unique as it's "for DBA by DBA". This one day symposium will have 5 parallel sessions with lots of time for networking and open discussions. I am lucky enough to be one of the presentors and my topic will be "Continuous Database Application Evolution in Oracle Database 11g Release 2 ", a mouth full. This session will discuss a new feature of Oracle 11gR2: Edition Based Redefinition. Not just "a new feature", it's "The new feature". The other day - yesterday actually - I got an email with a question regarding Analytic Functions. In a table there are a CODE, STARTDATE and VAL columns. The combination of CODE and STARTDATE are mandatory, the VAL is optional. I want to get an overview where the VAL column shows the latest (based on the STARTDATE) value. If there is no value filled out for a particular date, it should show the value of the latest entry for that particular CODE. As you can see in the above output, there are two CODES ("A" and "B"). The combination of CODE and STARTDATE is unique. The last column (VAL) has some values filled out, not all. When the VAL column has no entry (IS NULL) the output should show the latest value of the VAL column - based on the Startdate within the CODE. Latest in this case means: the most recent value of the VAL column with regards to the STARTDATE column of the current record. Is the requirement clear? Time to solve it. I will show you two ways of solving this, there are possibly many more ways of getting the required output. One way is quite cumbersome, but will work in Oracle 8.1.6 EE and up. The other way is really trivial and works in Oracle 10g and up. Now the column NEW_VAL shows the marker for each subgroup. Using the "running total" technique we can clearly see which records belong together. With the distinction made - you can see the different subgroups, each having a unique number within the partition, we need the first value of the VAL column per subgroup. For that we will use the FIRST_VALUE function. Notice that the partitioning clause in the FIRST_VALUE is using the subgroups we defined in the previous section as well as the CODE. And there you have it, the required result. But it takes a lot of typing. In Oracle 10g we can get the same results, but a lot simpler. Newly added in Oracle 10g is the IGNORE NULLS clause. And it does exactly what it says, it ignores nulls. In the following query, I inserted the windowing clause in there. Just to be very explicit. As the Windowing Clause is the default, you can also omit it. The Merge statement was introduced in Oracle 9i and improved upon in Oracle 10g. In Oracle 9i only the INSERT and UPDATE parts were supported, in Oracle 10g DELETE was added. The "merge_update_clause" and "merge_insert_clause" became optional. DELETE can only occur in the "merge_update_clause" of the above schema. This means that it must occur in the WHEN MATCHED THEN clause. Until recent, I missed this part of the description of the "merge_update_clause" concerning the DELETE operation. First I will show you what I thought, then I'll show you where the behavior is documented. Notice that the last record, with RN 5, has an Ind "D". Next we will merge a record into this table. Only one row? Shouldn't that be two rows? One for the UPDATE and one for the DELETE? Question for you: Which record(s) is (are) affected by this statement? Record with RN 3 has had the IND column changed to "D" and all records with IND "D" are removed. Effectively removing records with RN 3 and 5. Now the quote from the documentation. The only rows affected by this clause are those rows in the destination table that are updated by the merge operation. This means that records in the destination table are not deleted when they are not updated by the MERGE first. As you can see the record with RN 5 is still in the table. Because it was not updated in the merge, it was not deleted. ... learn something every day. Sometimes you encounter a function that makes you wonder why Oracle made it. NVL2 is one of those functions, at least I think so. Even though it was introduced quite a long time ago, I've never used it in production code. The NVL2 function takes three arguments. The first argument (could also be an expression) is evaluated for NULL or NOT NULL. When this argument evaluates to NOT NULL, the second expression is returned. When the first argument evaluates to NULL then last (third) expression is returned. In The Netherlands, where I'm from, you can choose the way your last name should be used after marriage. Say we have a table which store your name, your partners name and your preference of "name usage"
I left out the Partner usage when there is no Partner - this would just be a "regular" NVL. The last two look strange, don't you agree? There are hyphens there when they shouldn't be. To implement an Arc relation in the database, the NVL2 function could also be useful. The Arc should be implemented on the T3 table. Either the relation to T1 should be filled or the relation to T2 should be filled. They should not both be filled for the same record. the value of the Case Expression (either "1" or "0") must be equal to "1"
This seems to work, When either relation is filled, all is well. When both relations are filled, or none of the relations is, the Check Constraint is violated. Now let's do the same thing with NVL2. The Check Constraint is a lot shorter, but does the same thing. And there you have it, two use cases - and an example from the docs - for the NVL2 function. What would be a reason not to use the NVL2 function? One reason would be that the function is quite hard to read (comparable to interpreting DECODE). Another would be that this function is not very well known. The Use Cases described above are the cases where I use the NVL2 function. Simply because it's so concise. Matter of preference I think. Do you use it? And how - for which use cases - do you use it? Just the other day on the Oracle SQL and PL/SQL forum, someone asked on how to create non-existent rows. This post is not about generating a number of rows. It's about handling Sparse Data, when you want to fill in some missing records in your result set. First time I heard about this was in a blog written by Lucas Jellema. As you can see in the sample data, Manager 14 has entries for the status "in process" and "done". Manager 15 only has entries for "in process". Manager 16 only has a single entry for "done". The result that we are after is to show for each Manager a total sales value for both statuses "in process" and "done". we only see values for records that are actually in the table... Go Figure! Nice results, but not exactly what we are after. We want an extra record for Manager 15 (with status "done" and sales value of 0) and an extra record for Manager 16 (with status "in process" and also a value of 0). One way to tackle this problem (or challenge if you prefer) is to use a Partition Outer Join. As far as i know this is not ANSI-SQL, but Oracle specific syntax. Tahiti.Oracle.com calls it an "extension to the ANSI syntax". This inline view will be outer joined to our table. What makes a Partition Outer Join work differently from a regular Outer Join? A regular Outer Join will show an extra single record even when a matching value is not present. 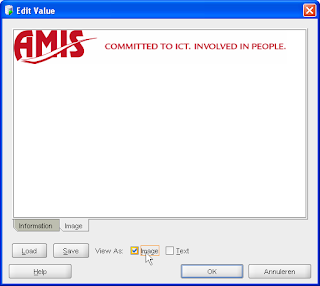 In our case, this will not make a difference as the values "done" and "in process" are present in our base table. What we want is to outer join all statuses from the inline view to our base table for each manager. And this is exactly what the Partition Clause does. It breaks up the result set per manager. Per partition (one for Manager 14, one for Manager 15 and one for Manager 16) we want to outer join to the inline view. Each Manager shows an entry for both statuses "done" and "in process", even when this value is not in the base table. This is one of those recurring questions on the Oracle Forums of OTN. How to split a comma delimited string? Of course there are several options how to tackle this problem. One of the most elegant ones, at least I think so, uses a regular expression. The first part creates some test data using the WITH clause (aka Subquery Factoring). The actual query with the regular expression starts on line 4. The list consists of all characters between the square brackets. Here the "^" (circumflex) indicates "except" or "not in". The "+" means: one or more times. The arguments of the REGEXP_SUBSTR determine which part of the string to subtract. The third argument to the REGEXP_SUBSTR functions tells it where to start with the regular expression. The last argument means which occurence to match. A little while ago Anton Nielsen posted a blog named "SQL for Spanned Data". The challenge was to create a sql statement to only return contiguous spans by division. In this post, I will use Analytic Functions to find contiguous spans. As Anton already provided the DDL for this blog, I will not be repeating that here. So, if you want to follow along grab the DDL from his blog and join the fun. To compare the current start date with the previous end date, we will use the LAG function. With the LAG function you can "look back" in your result set. The last column (named Span_Group) now contains a list of 1 and 0. The "1" indicate the start of a new Span Group. This sample set therefore contains two Span Groups. Using the Running Total technique, we can more clearly identify the Span Groups. Because it is not possible to nest analytic functions, we push the query we build so far into an inline view. Then we can use the SUM () OVER () on the Span Groups we created earlier. The last column in the result set (named SPAN_GRPS) now clearly identifies the two groups. Enough said,.. Another case to show the power of Analytic Functions. The results which I got from my query are the same as the results from the first query in the original post. Nowadays I use SQL Developer on a daily basis, and I like it more and more. But every now and then something rears its ugly head, and that can be annoying. I tried re-installing SQL Developer, reboot the computer... no success. "Google is your friend" at times like these. One of the first hits I came across was this blog post and that solved my problem. The only thing you need to do is go from the menu "Tools -> Preferences" and in the Preferences window to "Accelerators", push the button "Load Preset" and pick the Default. And that's it. Now it works like a charm again. On Monday, June 15 there will be a sneak preview of the upcoming ODTUG Kaleidoscope Conference. Some of the European speakers (that is Belgian and Dutch) will be doing their presentation. I'm just guessing here, but I can imagine that the presentation will be in Dutch. Roel Hartman (Logica) – How to integrate APEX and Oracle Forms? Last year we did a similar Sneak Preview which was a great success. If you want to attend then register early, seating is limited. Oh, and did I already mention that this session is free? 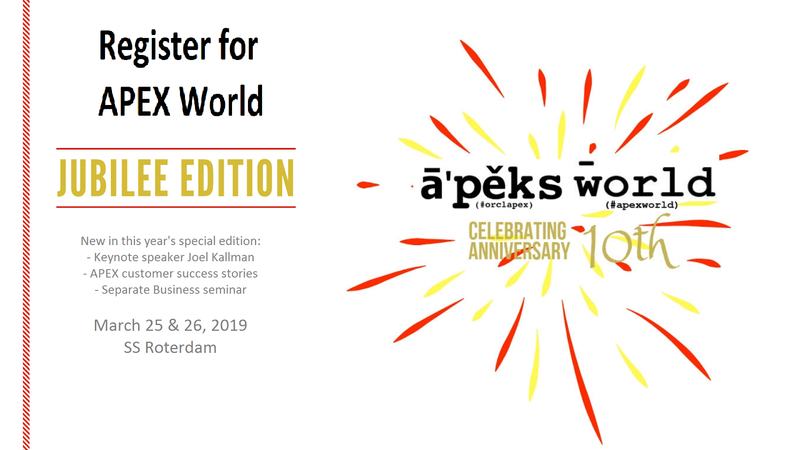 More information and registration can be found in the Agenda via the AMIS homepage. By accident I discovered something in SQL Developer. Another one of those things I need to remember for future reference. Hope you can use this feature too. You know you can use CTRL + C for copying and CTRL + V for pasting. Nothing new there, but what is really neat is that you can use SHIFT + CTRL + V to see the contents of all your clipboard items. Because I needed to do a lot of copying today, this came in really handy. For the client where I'm currently working, the need arose that we needed to find lastnames regardless of diacritical characters. In Dutch, we have lastnames (and firstname too) where characters like ü, ä, ö, é occur. The "usual" way to handle this was to add a column to the table, and store the name there without the diacritical characters. Meaning the name "müller" would be in one column, while another column would contain the name "muller", the same letters but without the double dots (called a trema in Dutch) over the "u". A common complaint with this approach, is that when you query with the double dots, you won't be able to find what you are looking for. There is also the possibility of using Oracle Text to handle this. In the past I have been to a presentation on Oracle Text, but never used it before. It scared me in a certain way. I thought it would be quite complicated to use it, but it turned out to be real easy. In this table are some variations of "Muller", upper- and lowercase and with and without the diacritical character. With base-letter conversions enabled, letters with umlauts, acute accents, cedillas, and the like are converted to their basic forms for indexing, so fiancé is indexed both as fiancé and as fiance, and a query of fiancé returns documents containing either form. And this is exactly what we're after. To be able to search using the Base Letter conversion, as described in the quote from the ducmentation, we need to create a Preference. To change the setting of the Base Letter, the default is NO, we to set this attribute to YES. In the above code, we create a preference, called CUST_LEXER. Because the main language will be Dutch, I use the BASIC_LEXER. More information regarding this in the Oracle documentation. The attribute that I want to override is the BASE_LETTER, so set that attribute to YES. And that should take care of it. Now the only thing to do is create the Oracle Text index and specify that we want to use our preference set. Now that we are all set, let's run a query and verify the results. And there you have it, it works as advertised. While writing this blog, a colleague of mine pointed out that in Germany it is accepted to spell the name "müller" as "mueller". Oracle Text can even handle that. Add this to your preference set, and you're good to go. This also works when searching for "Mueller"
The problem with Oracle Text used to be the synchronization of the Text indexes with DML actions. In the old days, you needed to take care of this yourself. Schedule a "make sure the Text index is updated to be in sync with the table". This could mean that after you added a name like "Désiré" to your table, you wouldn't be able to find because it wasn't in the text index. Starting with Oracle 10g (release 2) you can indicate that the index needs to be synchronized during a COMMIT. Just specify it with the creation of the index, and that's it. This Oracle Text is really cool stuff, and this is just the beginning. The Oracle Documentation is a great source of information. A link is included at the bottom. Images can be stored as a BLOB in the database. SQL Developer can show them as well. Choose an image from your file system, and commit your changes. Step 3) On the "Data" tab, click the "..." button with the BLOB column. 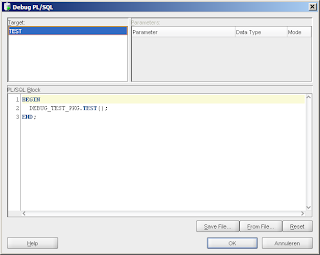 My favorite development tool is PL/SQL Developer by Allround Automations. The Debugger included with this tool is great, I really like it… but… not for Associative Arrays. First we declare a Record, based on some of the columns of the infamous EMP table. Next we declare the Associative Array based on the Record structure. Then we need a (packaged) procedure, which we are going to debug. The type declaration and the procedure are both in a Package, of course. PL/SQL Developer has a Test Window, where you can run an anonymous block. It is possible to call this window whenever you feel like, no need to be in the context of a Package like in SQL Developer. Nor does the package need a breakpoint. And this is a good thing, 'cause most of time I forget to set breakpoints. SQL Developer, Oracle's free IDE, also has a Debugger. And what is really nice about this debugger, is that you can view the content of the Associative Array. You can look on the "Smart Data" tab to see the content of the Associative Array. Simply Brilliant! Great Job, Sue! When you have a function that returns a Boolean, you know that you can't use it in SQL. SQL just doesn't have a Boolean datatype. It is easy to overload the function, provided you placed it in a package, to return a datatype which is compatible with SQL. Can you spot the flaw in this? The function will return a zero when the original function returns FALSE or NULL. This function will return a 1, 0 or NULL. Currently I'm in the process on reviewing some chapters on an upcoming book... more on that in a later blog, 'cause I am not sure if I can talk about it or not. One of the chapters is on "Exceptions" and I noticed a line from the Oracle documentation which I didn't notice before. The VALUE_ERROR (ORA-6502) and INVALID_NUMBER (ORA-1722) are predefined exception, which can be handled by name in your exception handler. "...In procedural statements, VALUE_ERROR is raised if the conversion of a character string into a number fails. (In SQL statements, INVALID_NUMBER is raised.)" Now let's check the procedural part, in PL/SQL. But what if you would use a SQL statement in PL/SQL? Would this also raise a VALUE_ERROR? As you can see, it raises the INVALID_NUMBER exception. I expected that it would raise the VALUE_ERROR as well. Sometimes it's too easy to ignore these little things. I learned something about exceptions again.